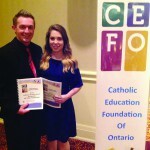 Two graduates of the Renfrew County Catholic District School Board (RCCDSB) recently received Catholic Student Awards from the Catholic Education Foundation of Ontario (CEFO) at an awards dinner in Toronto. 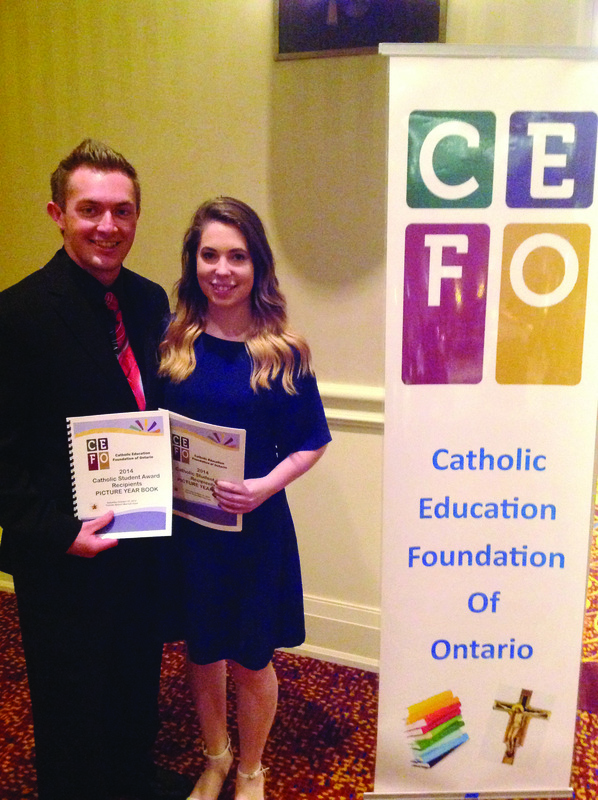 Mitchel Schroeder, who graduated from Bishop Smith Catholic High School last June, and Sarah McGrath, a graduate of St. Joseph’s Catholic High School in Renfrew, each received the CEFO’s 2014 award at the 31st annual Father Patrick Fogarty Awards Dinner held on October 25 at the Toronto Airport Marriott Hotel. The Catholic Student Awards were created by the CEFO to recognize and celebrate the excellence and accomplishments of young Catholic men and women. The awards also pay tribute to the positive influence, inspiration and works of Catholic teachers, chaplains, school administrators and parents. 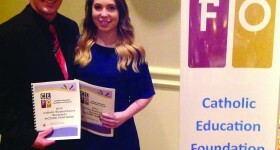 Award selection is based on a student’s scholarship, volunteer work and community involvement, as well as for conduct that models Catholic values. Schroeder, who now attends Algonquin College in Pembroke, as well as running a lawn-care business, says that BSCHS taught him to be thankful for many things, including his Catholic education and the teachers at BSCHS. “What I learned from my time at BSCHS is that I will never stop being grateful for my life. I love my life. I think that I do have a purpose. I do make a difference. My many Pro-Life trips to Ottawa reminded me that I am thankful to be here,” he added.